To illustrate, let’s imagine a two-person scene (for actors of any gender) with some basic parameters. In our imaginary scene, Person A wants to leave the room, and Person B wants to prevent that. Let’s also assume that these characters are in love, and Person A has been drinking. This trap occurs when the actor plays the character’s ego, making performance choices that will allow the character to save face by avoiding pain or embarrassment. Emotionally or physically compromising actions — like begging, being vulnerable, physical touch — that the script calls for will come across as hesitant and unconvincing. Using our imaginary scene, Person B may avoid begging Person A to stay, because humbling oneself in that way feels too vulnerable, shameful, or excessive. Or Person B may shift away from Person A when asking them not to go, rather than communicating, “I really need this.” When students act from a position of protecting their character, they fail to convince. For example, Person A might say, “I’m leaving,” but hesitate to push past Person B. However, good actors thrill us often because they do things that are extreme, rude, or unusual. Young actors sometimes think, “That doesn’t feel real,” or “My character would never do that.” What they mean is “I would never do that.” And to be fair, that’s honest. In everyday life, we protect ourselves from feeling vulnerable or exposed. But plays are rarely about typical days. After all, how many scenes depict an uneventful trip to the dry cleaner’s? This trap conveys a misunderstanding of Stanislavki’s Magic If. Acting behavior is not about what you would do in a like situation, it’s about what you would do if you were that exact character in that exact scene. If the script requires a character to fully engage in the act of begging, embarrassment is unavoidable. In fact, it’s the goal. This trap impairs the scene by constantly de-escalating conflict, so as a teacher, it can help to re-escalate using physical means. Have students run in place to drive up their energy. Have them hold hands, link arms, or touch elbows to force close contact. Or have the actors stand on chairs at opposite sides of a large room, so they must yell to be heard. Then try blocking the scene so that each character must physically do something for the action to continue, such as Person B pinning Person A into a corner. If you and your students are comfortable doing so, graft expletives onto the lines. Have your students exaggerate the circumstances or obstacles. Make Person A so drunk that their words are slurred or incomprehensible, or give Person B superpowers that allow them to send Person A back two steps simply by pointing. Young people have always been concerned about social status and peer opinion, and the age of social media has put everyone in a public spotlight. As such, the social consequences of being wrong or looking stupid have been magnified. However, mistakes are inevitable — even desirable — during the rehearsal process. Trial and error is how actors learn what character choices will work, so the freedom to look foolish and “fail” is a necessity. A failure-avoidance mindset will stop good acting before it starts. Actors trapped by self-consciousness and fear of failure may freeze, unable to make any choices at all. They constantly look to the teacher or director for encouragement. To avoid looking stupid, they shrink their voices and bodies. They listen to themselves, thus focusing inward, rather than reacting to their scene partners. They stick to prepared line readings. In our sample scene, Person B might not do anything to get Person A to stay — beyond standing there and reciting lines. Students may worry that “big” acting will appear fake, so they don’t do anything at all. The best way out of this trap is to engage in the exact behavior that students seek to avoid — stupid, silly, and big — and hope that the resulting peer laughter will embolden them. Voice and speech teachers can increase vocal size and agility by having students perform in exaggerated accents, like gregarious Italian or Edwardian British. To free them physically, give a student a prop to swing or wave about with each line, like a sword, a magic wand, a staff, a handkerchief, or a feather duster. Have students stand in sumo wrestler poses — bent legs in a wide stance with their arms akimbo or stretched out with their hands in fists — while speaking in a very low, loud voice to increase stage presence and size. Ask them to add the words “And I mean it!” after every line or a mild profanity, if you’re comfortable with that. Let students discover that big can still be truthful. Sometimes actors can go too far in the other direction. Playing the obstacle means letting the character’s impairments, like drunkenness, overwhelm the goal, that is, what they want. Playing the mood happens when a character’s emotion, like sadness, becomes the goal: “I want to be sad.” Conditions can get in the way, too, such as young actors in a period piece letting the physical challenge of corsets and long skirts get in the way of tapping certain moods, goals, or actions, as if characters who must sit up straight could not possibly have real needs and desires. Now our imaginary scene becomes all about how drunk Person A is, how slurred their words are. Or instead of playing the goal “to prevent Person A from leaving,” the scene devolves into how upset Person B is. As a result, the story gets lost. To address action/obstacle confusion, boil down the scene to its essence. Remove all other given circumstances and assign Person A one single line — “I need to leave” — and Person B another — “I want you to stay.” Allow only those lines in an improvised version of the scene, and work it until the actors seem to grasp those simple goals. Next, replace the circumstances that have become traps with new circumstances: too much caffeine, shyness, old age, or a physical challenge such as a broken leg or a need to use the bathroom. Playing the actions of the simple, improvised scene with a variety of obstacles will demonstrate how obstacles or conditions may interact with, but need not fundamentally affect, the goal. To address action/mood, have the actor play the mood but exaggerate it 1,000 percent so that the scene falls apart. This enlarges the problem so that everyone can see and talk about it. If a student cannot let go of the mood, have them pick an opposite mood, like replacing sadness with joy or silliness, and play that before refocusing on actions. Sometimes inexperienced actors infuse all meaning into the spoken lines and forget about actions, subtext, or even context. These actors often treat the script too literally, failing to perceive the hidden or contradictory thoughts and desires that belie the character’s words. In their desire to follow directions and do something, line-driven actors may stammer, add words or noises, or over-emphasize certain words by adding lots of pauses. They frequently develop deeply ingrained line deliveries. 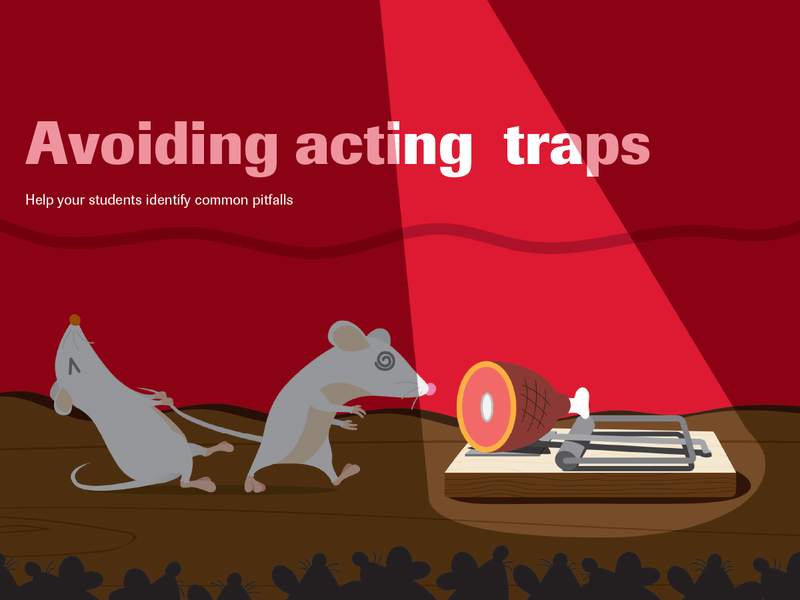 When this trap falls, the scene often flat-lines, losing all energy, drive, or pacing. The student seems to be merely reciting lines. It could be that they don’t know the meaning of the words or have failed to make that meaning real for themselves. Sometimes an actor in this trap makes the most obvious, emotional, or highly sentimental choices. Some script analysis is in order: If a character says, “I don’t like you,” do they really mean it? Is it a lie? Is the character hiding something? Explore the relationship between the two characters so that “I’m leaving” gains some force. Slow down the scene or speed it up to disrupt prepared line readings. Ask the young actors why after every line. Why are they doing this? Why are they saying this? Why are they using this word instead of that one? And so on. Add subtext of any kind: it’s a secret confession, you have a fatal disease, you are a long-lost brother or sister, you are a madman or an alien or Superman, the building is on fire — anything! This shows students how line deliveries can change. Finally, don’t let the students remove the thorns. In Patrick Marber’s play Closer, students may struggle with the idea that characters could be in love with two people. Sorry, they are. Don’t make the scene easy. Remind young actors that a play lives in the moments between the words. It takes place in the thoughts, actions, and gestures of the character. Doing the opposite of what you are saying can be much more powerful than doing and saying parallel things. For many young actors, “I love you” always means “I love you,” but maybe it’s conflicted, maybe it’s a lie, a regret, a hazard, or a risk. It’s more interesting to combine “I love you” and “I can’t make eye contact” than to combine “I’m leaving” and “I can’t make eye contact.” One is surprising, the other is not. Subtext makes everything more complicated and therefore more dramatic, messy, and human. Sometimes it’s obvious: not showing up for rehearsals, falling behind on memorization. Other times, actors fail their partners in more subtle ways, such as when one actor attempts to direct their scene partner or fails to deliver the actions necessary for the scene to make sense. Poor partnering hinders others from experiencing reactions appropriate to the scene. For example, when Person A says, “I’m leaving!” but doesn’t leave or goes so slowly that Person B’s scripted plea to stop doesn’t make sense, the former actor isn’t being a good partner. Perhaps Person A anticipates that Person B will prevent her exit and so lingers, rather than allowing Person B to actually prevent them from going. In failing to pursue their own action, Person A interferes with Person B’s action. Suggested solutions: Sanford Meisner often described onstage behavioral exchange as the Pinch and the Ouch. You cannot say ouch until you’ve been pinched. Actors must be responsive to each other, just as athletes on the field, dancers on the floor, or musicians in a band. In a scene, someone pinches, someone else responds, and these roles trade off throughout the scene. Try breaking down events into their moment-to-moment story, like a sports play-by-play: Person A goes to leave. What happens then? Do they make it to the door? No, Person B says, “Stop.” Does Person A stop? What happens then? Assuming the actor has read the whole play, they know more than their character does. Playing the end occurs when the actor allows the character to behave as if they know what’s coming. The actor must take care to allow the character to learn things at the exact moment they should and to remain ignorant of unknowns until then. This occurs often in monologues. Actors trail off or signal the end of a monologue in the last few lines, rather than driving all the way through to the last word. Of course, the character doesn’t know they’re speaking a monologue, and they haven’t necessarily planned their precise stopping point. In fact, just as in real life, characters are often surprised to find they have nothing left to say. Other times, they have plenty more to say, but they get interrupted or pause but never return or otherwise suddenly choose to cut themselves short. Likewise in scene work, actors playing the end will sometimes stop pursuing their goal or lose energy, because they know the play does not call for them to win in the end. Person A won’t try too hard to leave, because they know that the scene ends with them staying, so why bother? On the other hand, Person B may only half-heartedly try to stop Person A, because they already know the script guarantees their success. Scenes lack sizzle when actors cut out the middle, which is the battle, and jump right to the end. This example of not being a good partner is important and nuanced enough to be its own category. Some actors succeed at playing an action and affecting the other person, but they struggle with letting themselves be affected in turn. It’s easier to play a stoic wall than a permeable, malleable (and flawed) human. Being affected by another person is frightening, so some students shut down to ensure it doesn’t happen. You may observe that no matter what Person A does, Person B’s facial expression, body, or voice remains the same. Remember that everything in a play has a cost, everything matters, so if the scene starts looking casual, that’s a clue. We are affected when things matter to us. Here you can again reference the Pinch and the Ouch, focusing on the impact and credibility of the ouch. Or talk about relationship. If there’s no love in the scene, no attachment, no chance for change, no possibility of win or loss, then the playwright would not have written the scene. Young actors need to know that, if they don’t care enough about the scene or relationship, then they won’t be open enough to take the hit. It’s about stakes, it’s about emotional availability, and it’s about listening and being committed to the action of the scene. It should be vital to Person B to keep Person A in the room. Even a line like “I don’t care” can convey great pain and vulnerability. One way for actors to get in touch with the need to be affected is to have them face each other and exchange the line “I can be hurt by you” until they begin to believe it. Other options are “You can change me” or “You can move me” or trading the words “I could change” back and forth. Actors can insert text before significant lines while rehearsing as a reminder to stay open, such as “I love you” or “I care about you.” Holding hands will increase the impact of these exchanges and help build connections between actors. The last and most important trap of not committing relates to that combination of energy and intention necessary for good acting. Actors may know everything — the givens, stakes, text analysis — but without commitment, none of it matters. This may be the effect of one or more of the above traps, or it may simply be that the students are not fully engaged in the story. They don’t care enough. Students who are not committed will have low energy, they will keep their hands in their pockets or play with their hair. It will appear as though they are playing it cool. Students may laugh nervously when you first give them blocking or an idea a little outside the box. They may attempt things gingerly or with self-conscious laughter. Engage the student’s imagination for sensory feedback. As the character, what do they see? What kind of ground is under your feet? What do you smell? Then ask them to commit: to their character’s need, to their scene partner, to staying open and being affected. Have the actor literally lean forward, putting weight on the front of their feet, or turn their hands palms up so they are physically receptive. Have them personalize the scene. Have they ever wanted to leave? Needed someone to stay? Been in love? Make sure they understand every line. If working on a scene in class — not a rehearsal — ask the student to design and draw a detailed floorplan. Where is the door, the window, the light, the fan? These techniques can help students feel personally invested in the creative process. As such, it can be a good place to start and might even help with diagnosing other traps. The best actors are capable of creating compelling, truthful life onstage, and that often requires doing things we wouldn’t do or say in polite society. Some of our favorite acting performances — Jack Nicholson in The Shining, Anthony Hopkins in Silence of the Lambs, Meryl Streep in The Devil Wears Prada — are delicious examples of terrible behavior that is fully committed, fearless, spontaneous, and huge. Teachers understand that students long for this kind of performance freedom, but they often get in their own way. It can be heartening to know that this tendency is common to all young actors, regardless of the classroom environment, and that there are ways to set your students free.